What a great week of weather! Lets cap it off with a good session of touch. 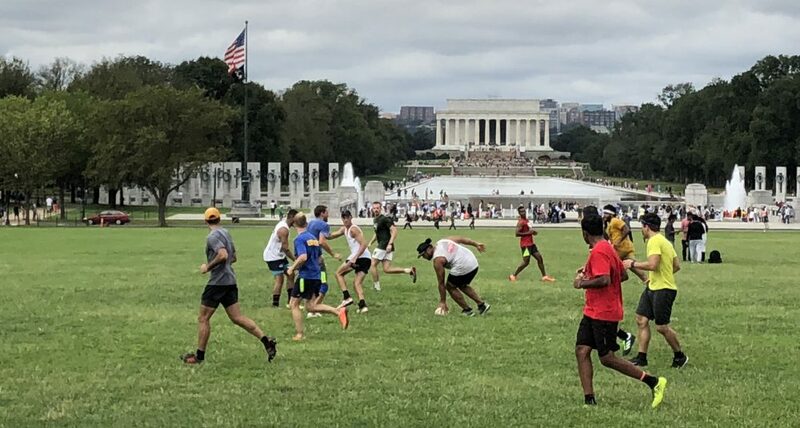 See you all out there at 930 am in the area we’ve been playing at close to 17th and Constitution and the Washington Monument. We will be playing in this area until further notice about our main field by the holocaust museum. 6pm tomorrow, let’s give the Tidal Basin pitch a go….. Despite today’s forecast, the morning is supposed to be cold, but clear. So we’re on for 9:30am, meeting here. If anyone’s passing the Tidal Basin please have a look at the state of the grass and let me know what you think. We may want to move back there soon. Also, daylight savings this Sunday – so hopefully we will be starting Wednesday touch on the 13th (weather dependent), around the same spot, 6pm-dark. Keep an eye out for a post next week. See you at 9:30am, same spot as last week. Weather looks okay earlier on with chances for rain increasing later in the morning around noon. Let’s shoot for a 9 a.m start at the place we’ve been playing at 17th Street and Constitution Avenue. Remember touch in the morning! See you at 10am tomorrow here!